Loving Rice: Blue plaid sticky rice, anyone?! Blue plaid sticky rice, anyone?! After spending the morning watching the Academy Awards, I headed to the kitchen to execute my adventure in Thai Sticky Rice production. Provided as an accompaniment to almost every street vendor's meal, sticky rice originates in northern Thailand and is intended to be eaten with your hands and dipped into the dishes it is served with. Each grain of rice is firmly intact (not mushy), yet a small pinch off of a ball placed in your hand yields a compact sticky little parcel of joy. While there are several techniques for making sticky rice, the most traditional involves soaking the grains overnight and using a steamer the following day. There are many websites fully dedicated to showing you the step by step "top secrets" of authentic Thai sticky rice making. And, at this point, let's just cut to the chase of this post, shall we? I am here to tell you that authentic sticky rice making is an art form that still alludes me. After hours of laboring over my pre soaked rice (I soaked enough to try several batches), the first method (and most often cited on all the other websites as the way to go) involves spreading your rice in a thin layer of a bamboo steamer and allowing it to cook until it is translucent. Translucency never arrived and I ended up with somewhat gluey rice that still had a crunch. Not at all what I was looking for. Next, I relied on the advice of a professional. Thinking back to what a wonderful chef in Hua Hin shared with me, I wrapped the rice in cheesecloth, again laid it to rest in the steamer and fired up the gas. Nope. My amazing Thai rice cooker whirred for the third batch and, even on the glutinous rice setting, didn't quite produce the wonderful little al dente grains I had hoped for. Finally, on an experimental whim, I wrapped a final batch of rice that had previously soaked for only about an hour into a newly purchased thin cotton dish cloth. I threw the package into a boiling vat of water on my stove top. One hour later, I cut the twine that held it closed, unwrapped the towel and voila!..... 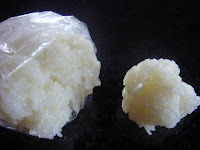 perfectly cooked translucent pinch able sticky rice. Unfortunately, it was stained with blue plaid from the newly purchased dish cloth! With sticky rice everywhere and my kids threatening to never look at a grain of rice again if I didn't stop the insanity, I threw in the plaid dish cloth and called it a day. A lot less complicated than the sticky rice served with meals, this black sticky rice is a show stopper of a dessert. I highly recommend it as the end to a fantastic Thai meal. Using a rice cooker or stove top, cook the rice (1 cup rice to 3 cups of water). It will still be firm when cooked through and may take a bit longer than the conventional rices you may be used to. Meanwhile, bring the coconut cream, 3 tablespoons of sugar and 1 teaspoon of salt to a boil. Reduce by a third. Taste and adjust the sugar/salt to your liking. The final taste should be sweet with a background of saltiness. Add half of the coconut syrup to the cooked rice and stir well. Serve the rice in individual dishes, topped with your fruit of choice and the remaining syrup alongside to drizzle over the top. I love your tweet feature you put up. Now I can know what is going on in your crazy life more often. Bonus! HA HA HA LOL ABOUT THE PLAID!